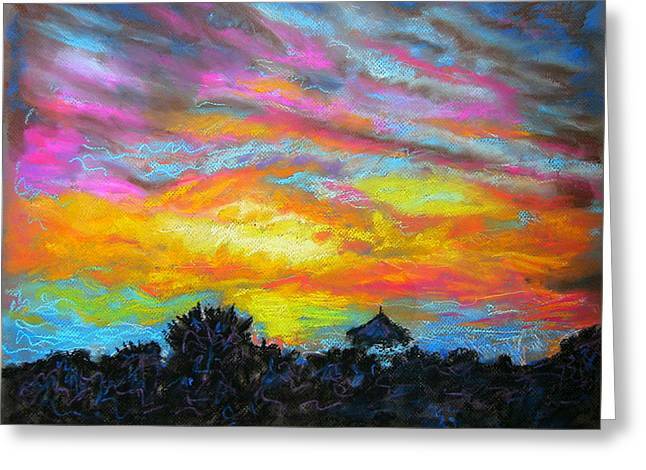 Glorious Sunset 1 is a painting by Laura Heggestad which was uploaded on January 15th, 2010. I'm in love with sunsets. If there were such a thing as magic in the world, I'm convinced its best form could be at work during sunsets. Watching a sunset makes me 'wake up' in a way that very few other things do...even when in the presence of much natural beauty I feel 'extra' alive. It's like I'm getting a front-row seat on the spectacle of the universe when encompassed by a sunset. This particular sunset blazed across the quaint town-scape of Lexington around early November 2009. I've used artistic license to leave only a few of the dark silhouettes from the town against the sky's color. I have left much of the pastel application highly textured and unblended. 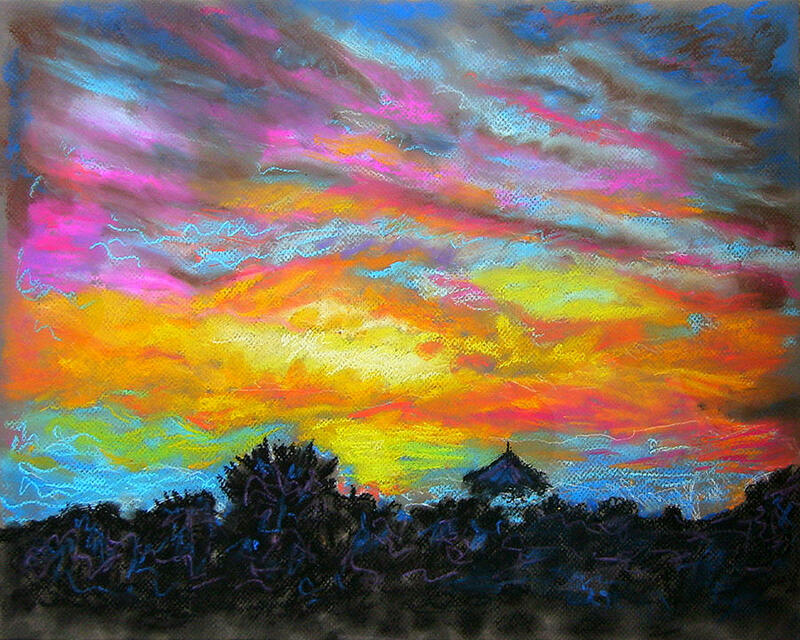 I find the contrast between the softer, brushy clouds and the vigorous, textured streaks to be an exciting effect. I love everything about this painting! The colors are awesome - a real treat for my eyes!! Thanks, Laura! Stunning color to this beautiful piece of artwork of your's Laura. This truly is a 'glorious sunse'. There is nothing more rewarding after a hard day, than to be walking through the countryside on an autumnal evening, as the sun sets. The crisp cold air blowing across one's face as mother nature paints the sky with the most breathtaking colours. Not only have you managed to capture the stunning colours, but you have also managed to capture the whispy texture of the clouds. This is the kind of artwork that I could easily stand in front of and admire for hours, as my mind wandered off into the sunset. Thank you for allowing us to come on your journey. Thank you so much! I've just gotten started on this wonderful website. Your comment is actually the first I've received...Thank you again!